Don’t forget about Philae! The comet lander made a touchdown a month ago this week on its target, marking the first time we’ve ever made a soft landing on such a body. Celebrations were quickly mixed with confusion, however, as controllers realized the spacecraft drifted quite a ways off target. In fact, we still don’t know exactly where it is. The parent Rosetta spacecraft is working well in orbit and still transmitting images of the comet while Philae hibernates in a shady spot below. This latest image here shows a clear view of where the European Space Agency thinks the lander arrived — somewhere in the rim of that shadowy crater you see up front. “The internal walls are seen in quite some detail. It is thought that Philae’s final touchdown site might be located close to the rim of this depression, but further high-resolution imaging is still being obtained and analyzed to confirm this,” the agency wrote in a statement concerning the image of Comet 67P/Churyumov-Gerasimenko. 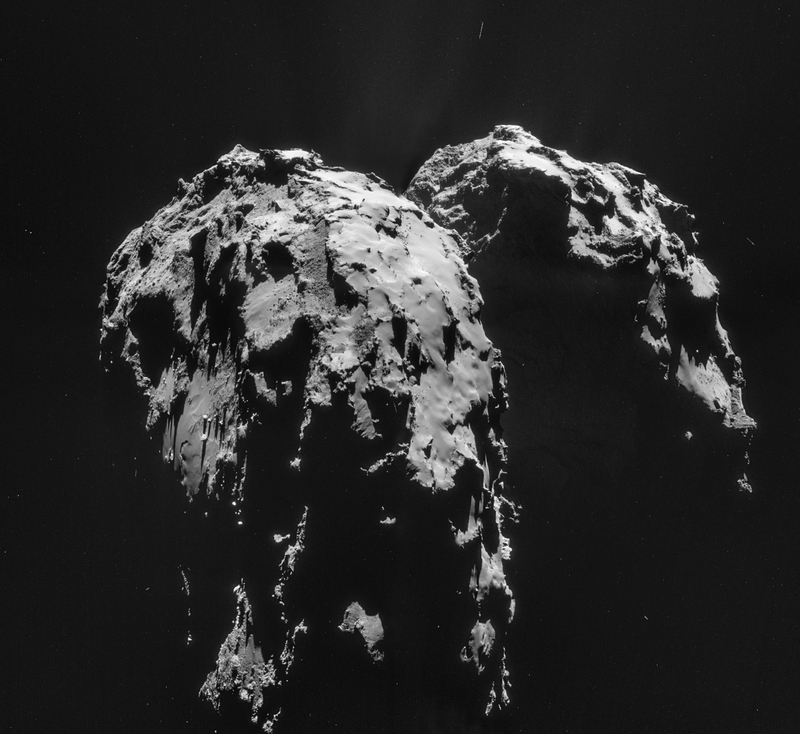 This is based on data collected from Philae in a brief science surge on the surface. Recently, information based on measured magnetic fields showed the spacecraft likely hit an object — perhaps a crater rim — as it drifted for two hours on the surface, unsecured by the harpoons that were supposed to fire to hold it in place. Searches for the lander are ongoing, but it’s hard to pick it out on such a boulder-strewn landscape. Yet the agency is doing its mightiest, and has made some progress on the problem since the landing took place. 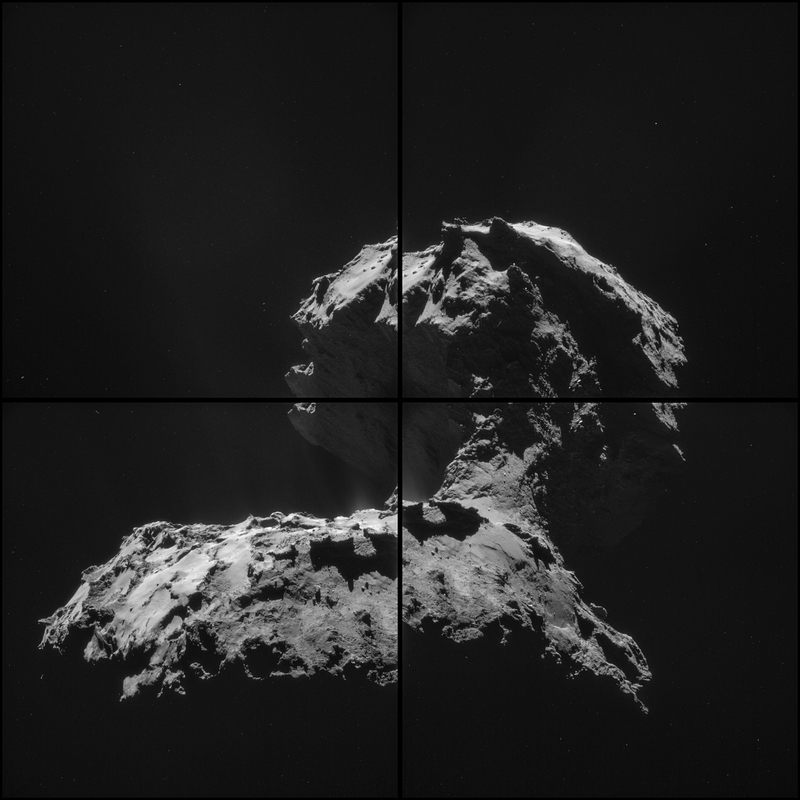 Rosetta caught several glimpses of the lander during its journey across the surface. And they have data from an experiment that communicated between Rosetta and Philae which could help pinpoint the location. 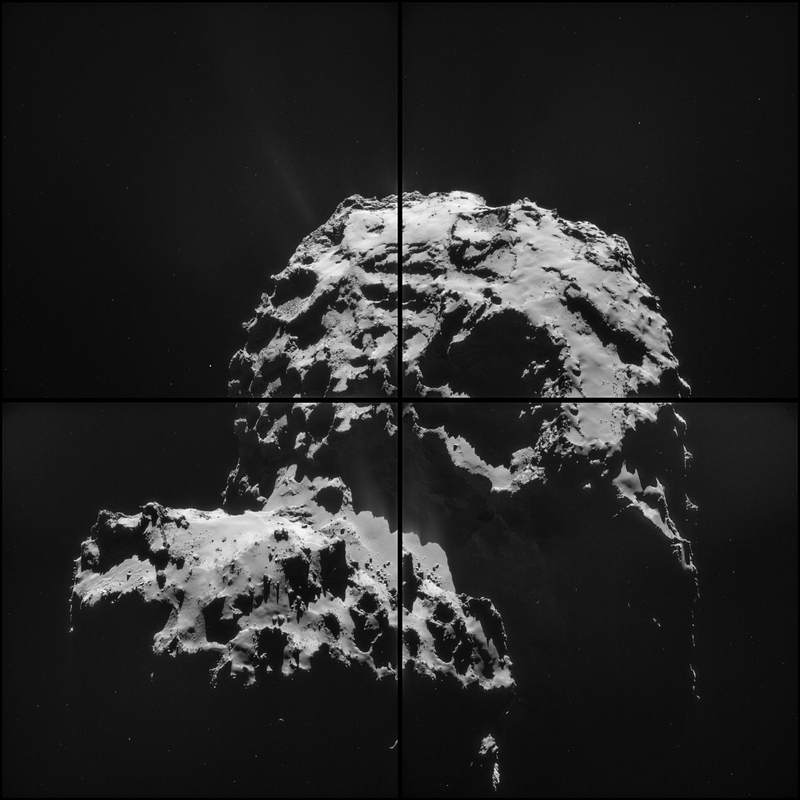 Rosetta science results have been quiet in the past week, although ESA has released several images of the comet. This comes as the agency has been criticized for its data release policy regarding the mission. It’s a vigorous debate, with there being examples of more open missions (such as Curiosity) and more closed missions (such as the Hubble Space Telescope) to compare Rosetta’s releases with. As these activities continue, however, Rosetta will remain transmitting information from 67P through at least part of 2015, watching the comet increase in activity as both draw closer to the Sun. Jets and gas are visible already in some of the recent images of the comet, which you can see below. Next time, maybe put a beacon light on the top that can be turned on? Wow, It doesn’t feel like it has been a month. Better put a beacon on the BOTTOM as well, apparently. It will come back to life when it gets closer to the Sun and/or when it goes around the Sun the Best is yet to come so keep looking up….. I wonder if they can use the CONSERT data (http://sci.esa.int/rosetta/31445-instruments/?fbodylongid=902) to back-track the lander’s position, or if not knowing the lander’s position will render that data unusable? I like the idea of putting a beacon on a lander…a very bright one at that! The comet rotates. Does that part where Philae sits ever get any sunshine? That should recharge its batteries. I’m surprised that hasn’t already happened. And if there is jetting from that spot as the comet gets closer to the sun, could it blow the lander up to try fro another, safer landing? Would like to see them crowd-source the search for Philae by releasing the OSIRIS images. Put them up on Zooniverse with the challenge of being the first to find the lander. They’d get hundreds if not thousands of eyes searching pixel by pixel.